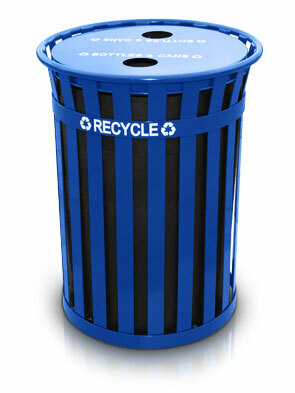 The Oakley Recycling Receptacle features two round openings on a flat top lid fitted especially for bottles and cans. The durable slatted steel frame is a common design seen in downtown areas lining busy streets and sidewalks, and the metal band at the top adds strength to last for years. Comes standard with Flat Top Lid. Plastic liner & Anchor Kit included. Two "Bottles & Cans" Decals Included. Matching planters & benches available. "Recycle" is written across the side with two recycling logos, and two "Bottles & Cans" decals are included for placement across the top, making the receptacle easy to recognize as a "green" solution. Available in 36 and 50 gallon sizes. Plastic liner, lid attachment kit, and Anchor Kit included.